Though we are based in Bristol, Sunday bike rides can be in the Quantocks, Brecon Beacons, Exmoor, Mendips and Forest of Dean, to name but a few of the top locations/mountain bike trails available to us in the West Country. 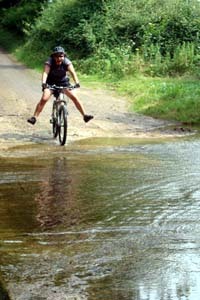 Mountain biking is usually also organised during the Club's regular multi-activity weekends away to locations all over the country. Favourites for mountain biking include Dolgellau, the Peak District and Llanwrtyd Wells. the AOAC runs mountain biking sessions most Wednesday evenings in Ashton Court and Leigh Woods - see calendar for details.